Pop Up Display Stands are one of the most popular and best-selling exhibition stand products on the market. They are so popular because they are a great value, portable, easy to use and look very professional. Pop ups come in a range of standard sizes but are also a cost-effective option for creating bespoke exhibition stands. Exhibitors often assume that a bespoke exhibition stand will only be attainable with a large budget but this is not necessarily the case. The humble pop up stand can be cleverly linked together to create large format, custom built displays which will wow customers and visitors. How Does a Linked Pop Up Stand Work? Linked pop up stands are very easy to use and are set up in the same way as a standard pop up but with ghost graphic panels to join the frames together. Clever and creative design and artwork will mean that your visitors will not believe your display consists purely of pop up stands. This means that all the components of your bespoke stand will fit into the carry cases provided, making even the largest exhibition stand portable and easy to transport. The aluminium frame is a ‘scissored’ lattice system which ‘pops up’ and clicks into place and magnetic bars attach to the frame. Each printed graphic panel has magnetic tape on the back which holds the panel in place on the frame. To link pop ups together there are linking graphic panels which join one frame to another. All visitors will see is a professional design with no clue as to the hardware set up behind. We print all pop up panels in-house in full colour to a photo quality standard. Once printed, each panel is laminated with a crystal matt laminate which is non-reflective. Laminating panels gives them tear, scratch and crease resistance meaning longer lasting artwork. The wheeled cases can be transformed into portable counters or meet and greet points for your stand. Simply add the beech top and graphic wrap for a professional promotional counter. What are the Linking Options? Pop up stands can be linked together in various configurations – L-shape and U-shape are popular to fit into a shell scheme space. But it is possible to create all sorts of designs including back walls, islands, T-shapes and cross shapes, using both curved and straight pop ups. 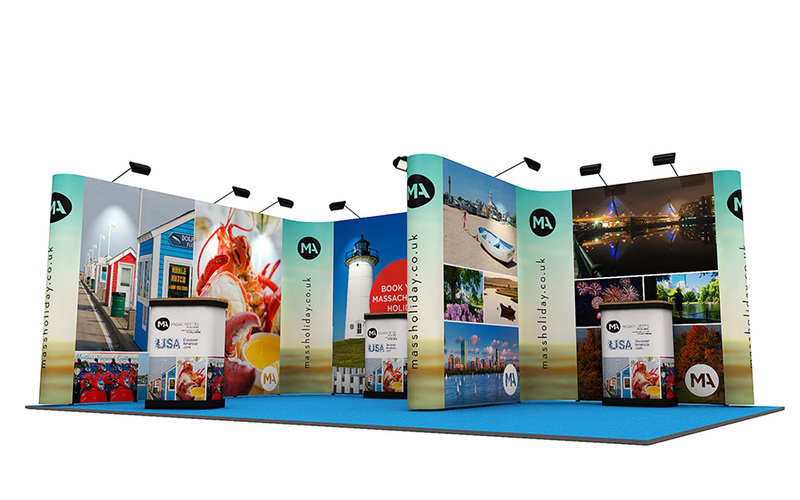 We can create a linked pop up system to fit any size exhibition stand space. The kits we offer online will fit stand spaces from 2m x 2m right up to 12m2 and everything in between. These kits include everything you need for the exhibition stand and the graphics are printed with your artwork. However, if one of these exhibition stands isn’t quite what you are looking for then use them as inspiration to see what can be achieved with pop ups and contact us for a bespoke quote. To enhance your linked pop up exhibition stand you can add accessories and other display options. Each pop up comes with a case which can be converted into a promotional counter but if you want more then you can add literature holders, iPad stands, printed flags, portable counters, roller banners, hanging display structures – there are so many options to make a linked pop up stand truly unique to you and your exhibition needs. Why Choose XL Displays for Linked Pop Up Stands? Expert advice – with over 20 years of experience in the exhibition industry we are the experts to talk to. Our well-trained sales team are on hand to help with any enquiries you have and can help find a display solution which works best for your business. Award-winning customer service – we are proud of our customer service and aftersales care which is second to none. Dedicated exhibition stand project manager – from your initial enquiry you will be allocated an exhibition stand project manager who will work with you through every step of the process until your event. They will also contact you after your event to check everything went well. Graphic design service and 3D renders – we offer a graphic design service and one of our talented graphic designers will create a linked pop up stand worthy of your brand and business. We can also produce 3D renders of the stand so you can see what it will look like printed with your artwork. 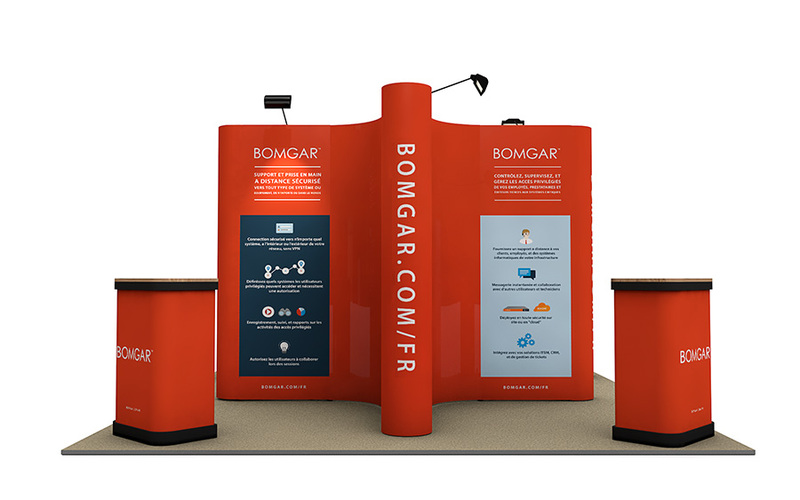 Reconfigure options – if you need to use your stand for more than one event and have different stand sizes and shapes to work with, we can remodel your linked pop up stand to fit. This means your stand can evolve to meet future changing exhibition needs. Free artwork checks – if you provide your own artwork one of our graphic designers will check it thoroughly to ensure it will result in the best possible print. Quality assurance – we text build and check all of our pop ups before they are dispatched to ensure they meet our very high standards. Customer reviews – don’t take our word for it, find out what our customers think of us on independent review site Trustpilot. For more information about our Linked Pop Up Stands and how they can work for you at your next exhibition please contact us or call 01733 511030.